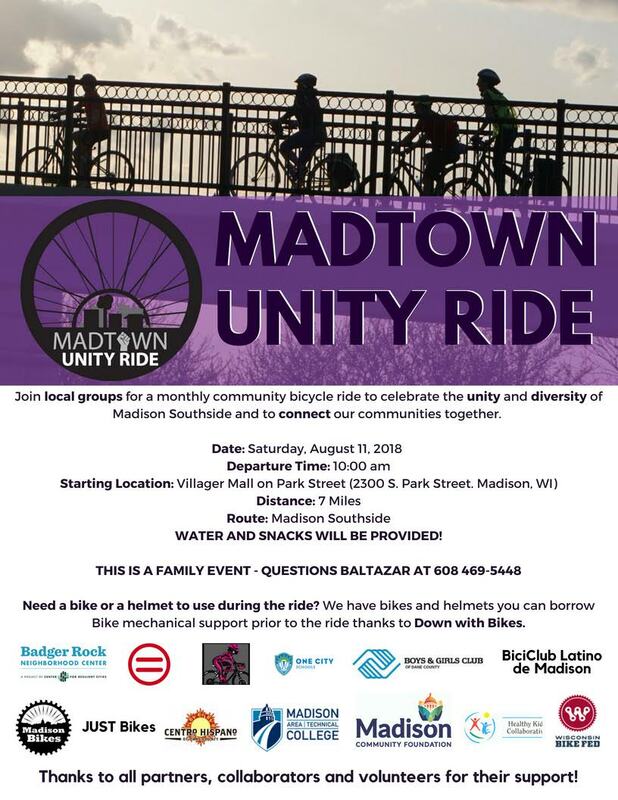 We at Madison Bikes are excited and proud to be supporters of the Madtown Unity Ride, a monthly community bicycle ride to celebrate the unity and diversity of Madison Southside and to connect our communities together! The Unity Rides happen every second Saturday of the month. So join the August ride this coming Saturday and help make it a success. MadTown Unity Rides are organized by local groups to celebrate the unity and diversity of Madison Southside and to connect our communities together..The target audience for these rides is Black, Brown, Indigenous people of color, LGBT+ community, the Senior community and other communities that have been affected by discrimination who live or work in a predominantly low-to moderate-income community in the Madison. We use these rides as a vehicle to increase social cohesion at the neighborhood level, as well as highlight the assets and inequities which exist in neighborhoods across the Madison Southside. The ride has been planned to travel through different neighborhoods in the Southside of Madison. Ride will start at the Villager Mall on Park Street and ride through the places that have become a landmark within our communities like the Urban League, the Villager Mall, Centro Hispano, Literacy Network, Madison-Area Urban Ministry, Omega School, Madison College South Campus, Penn Park, and Boys and Girls Club..
Join us as we ride through the Southside neighborhoods. THIS IS A FAMILY RIDE. WE WILL RIDE SLOW. No bike, no helmet? No Problem. You can borrow a bike and helmet to use during the ride. We will have snacks, music, water and fruit. 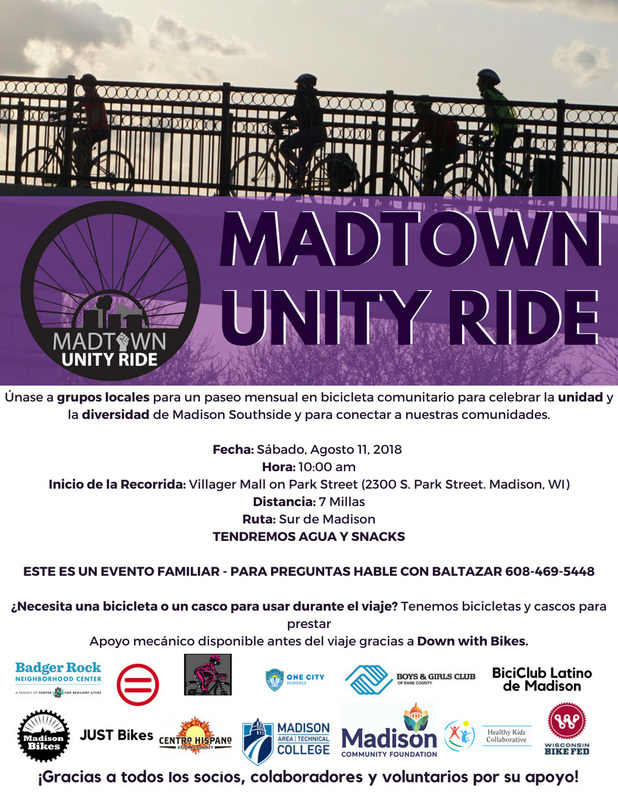 Únase a grupos locales para un paseo mensual en bicicleta comunitario para celebrar la unidad y la diversidad de Madison Southside y para conectar a nuestras comunidades. Apoyo mecánico disponible antes del viaje gracias a Down with Bikes. ¡Gracias a todos los socios, colaboradores y voluntarios por su apoyo!